I apologize to my readers for the delay since my last post: it’s been a very busy few weeks. But more on that later. First, I want to issue a last-minute alert on a very important conservation issue with a swiftly approaching deadline for public comment. The deadline for public comment on this is Monday, October 19th, 2009. What’s the issue? In short, the Farm Services Agency is accepting public comments on the environmental impact of two possible policy alternatives for the Conservation Reserve Program, an important mechanism for protection of wildlife habitat and biodiversity on working farms. Here’s a little background. The CRP (Conservation Reserve Program) is a land retirement program administered by the Farm Services Agency (FSA), and implemented by the USDA Natural Resources Conservation Service (NRCS). Basically, the government pays eligible farmers an annual rental rate for taking cropland or certain marginal pastureland out of production and keeping it that way for the life of the CRP contract (10-15 years). In addition, farmers receive a cost-share assistance payment for “practices” they install on the enrolled acres, including wildlife habitat plantings, erosion control, riparian buffers, etc. With more than 33 million acres enrolled in CRP nationwide, the program has become an important tool for conservation of biodiversity in agricultural landscapes. Grassland birds, insect pollinators, quail and other upland game birds, and many additional species use CRP land. Now, however, the number of acres enrolled in CRP is likely to be threatened by the economic reality of our times. With corn and cellulosic biofuel production receiving considerable economic and political support, CRP rental rates are unlikely to be high enough for farmers to maintain land in the program. The “opportunity costs” of CRP, i.e. the potential earnings for biofuel production, are increasing. I wrote about this issue in a previous post, Biofuels and Habitat Loss, which also provides further background on CRP for those of you who are unfamiliar with the program. At the same time that biofuels are threatening to reduce CRP acreage via economic competition, FSA is considering (see Alternative 2 below) reducing the CRP acreage enrollment cap from 32 million acres (the cap authorized in the 2008 Farm Bill) to 24 million acres, a full 25% reduction. Alternative 2 also cuts the acreage cap for so-called targeted enrollment programs by a combined 50%. These programs include state partnerships like the Conservation Reserve Enhancement Program (CREP) and State Acres for Wildlife (SAFE), as well as Continuous CRP, as well as special initiatives. All of these programs are enhanced versions of CRP that allow targeted enrollment for particular wildlife species or habitats, including species of conservation concern. 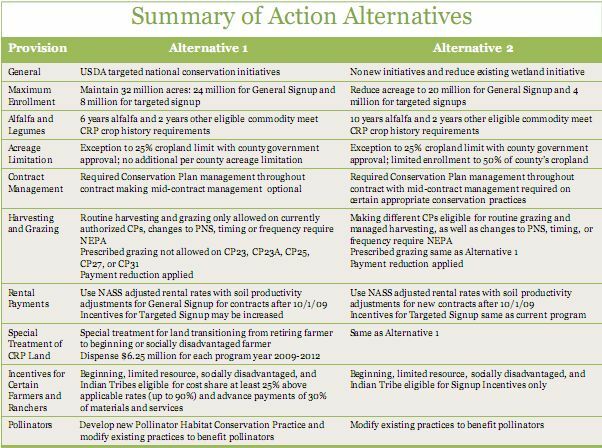 Alternative 2 would also nix plans for a separate pollinator habitat practice under CRP. This is challenging because it means that standard cost-share rates for existing practices would have to be used for pollinator habitat creation, a practice that is generally significantly more expensive (due to high plant materials costs) than other traditional conservation practices. You can review the public meeting slide presentation prepared by GeoMarine, Inc. here. The following comparison of alternatives is taken from this presentation. I just spoke with an FSA representative who informed me that, while the two alternatives are currently being presented as two discrete alternatives covering all the provisions, those providing comments should feel free to voice support for either alternative in each provision. In other words, if you agree with Alternative 1 for several provisions, but Alternative 2 for a few other provisions, you can state that in your comments. Please take a few minutes to provide your comments on this important issue at the comment page on the GeoMarine, Inc. web site. Wildlife that depends on our agricultural landscapes is depending on you to make your voice heard.